FEBRUARY IS THE MONTH FOR MATCHMAKING! We all know that February is traditionally the month for letting those you love know how you feel about them. That makes this the perfect month for us to show the beautiful dogs in our care how much they mean to us, and to remind them that true love will find them one day. Thanks to the compassion and generosity of several incredible animal lovers, February is Matchmaking Month for German Shepherd Rescue of OC. This means that every donation that we receive from February 1 through February 29 will be MATCHED dollar for dollar by wonderful individuals, up to a total of $8000 in matching funds! WOW! With your help, our dogs can earn $16K just in February alone! No matter how large or small your donation, your gift will go twice as far when you donate in February, which in turn means that we can extend helping hands to even more dogs in need. We have so many beautiful dogs depending on us, not only for their urgent medical needs, but for their day-to-day care as well. Despite our best efforts, some of our residents have been with us longer because they just have not found their forever families (yet). Take Sullivan and Cocoa, two senior sweethearts who are deeply bonded. Sullivan, age 9, had been placed in a family six years ago, but his owner died and family members decided to return Sullivan to our rescue. When we learned that a second dog in the family had also been orphaned, we couldn't bear the thought of taking Sullivan and leaving his best friend behind just because she was not a German Shepherd. We welcomed precious Cocoa, age 11, into our rescue raft and never looked back. Sullivan is very devoted to Cocoa and gets nervous when she is out of sight. Cocoa is silly and flirtatious, and provides comfort for Sullivan. These two love birds have been patiently waiting for a family that appreciates the special gifts that senior dogs bring. While they are awaiting adoption, their monthly board and care costs exceed $500 each. Your gift would go a long way to help us with this expense. Shadow and BrandiAnother darling duo is Shadow and Brandy, two senior girls who lost their home due to foreclosure. 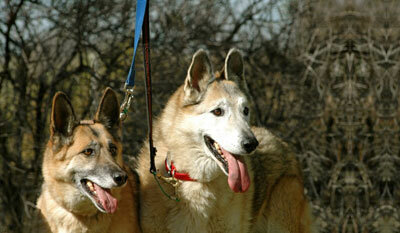 Shadow, age 9, and Brandy, age 11, were much-loved dogs whose owners never thought they would find themselves homeless. 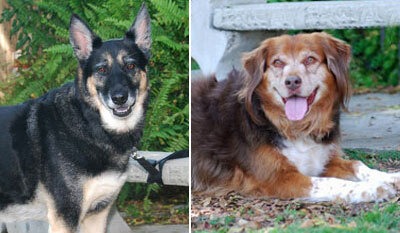 Shadow and Brandy are healthy senior dogs that still have plenty of love to give. They are quiet and well-mannered and enjoy the company of other friendly dogs. Shadow and Brandy are looking for a fresh start in a new family that will cherish them, but in the meantime, German Shepherd Rescue of OC is responsible for their day-to-day board and care costs. Both girls require joint supplements to help them with arthritis aches and pains, but they still enjoy leisurely walks to sniff out the news of the neighborhood. Would you please consider helping to offset their care costs? PLEASE HELP US HIT OUR GOAL THIS MONTH! By pledging your donation of any amount during February, you are actually helping twice as many dogs because your donation will be matched! We want to hit a target of $8000 to be matched, and we can do it with your help! Please send your tax-deductible gift to help our orphans TODAY! Our dogs are counting on us and we are counting on you! GERMAN SHEPHERD RESCUE OF OC TOEARN DIVIDENDS FOR OUR ORPHANS.